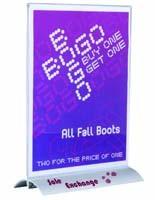 This branded table tent base includes a 1-color custom vinyl imprint on each side of the silver snap base. 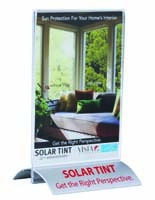 Each high visibility menu stand has a clear acrylic bottom load frame that holds 4" x 9" full color graphics. The double-sided table tent base with custom printing is perfect for showcasing business advertisements, specials, event or sales information. 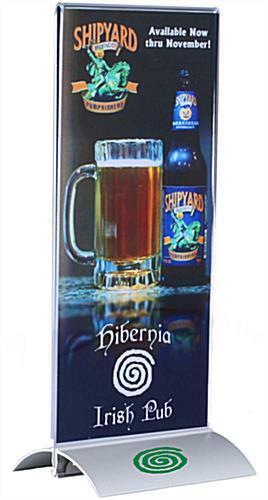 Tabletop advertising is an economical choice for restaurants and retail environments as well as at trade shows and promotional events. The silver aluminum table tent base's snap open design works with the bottom-loading clear acrylic display frame to allow fast, easy graphics changes. 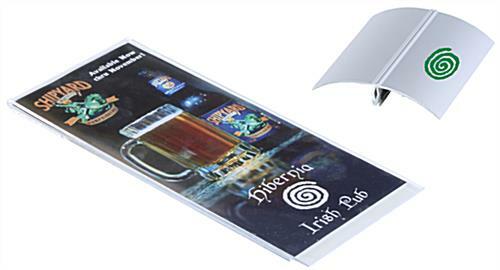 This economical business accessory is a perfect choice for creating full color tabletop advertising displays that will draw customer attention. 4.1" x 14.5" x 3.3"
An in-stock lead time of 6 business day(s) begins after the artwork proof has been approved. Product does NOT ship on a same day basis. We are unable to accept orders for less than 20 units per image.